Property Location With a stay at Clarion Hotel in North Little Rock, you&apos;ll be close to Old Mill and William J. Clinton Presidential Center and Park. This hotel is within close proximity of Dickey-Stephens Park and Arkansas Sports Hall of Fame.Rooms Make yourself at home in one of the 150 guestrooms featuring refrigerators and microwaves. Complimentary wired and wireless Internet access keeps you connected, and cable programming provides entertainment. Conveniences include phones, as well as desks and complimentary newspapers.Rec, Spa, Premium Amenities Enjoy recreational amenities such as an outdoor pool and a 24-hour fitness center. 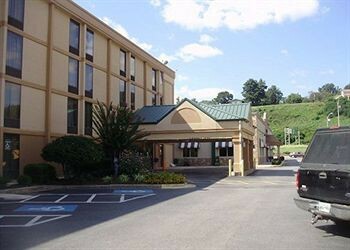 This hotel also features complimentary wireless Internet access, supervised childcare/activities, and shopping on site.Dining Grab a bite to eat at the hotel&apos;s restaurant, which features a bar, or stay in and take advantage of room service (during limited hours). Quench your thirst with your favorite drink at a bar/lounge. Full breakfasts are available daily for a fee.Business, Other Amenities Featured amenities include complimentary high-speed (wired) Internet access, a 24-hour business center, and complimentary newspapers in the lobby. Planning an event in North Little Rock? This hotel has facilities measuring 270 square feet (24 square meters), including meeting rooms. A roundtrip airport shuttle is complimentary (available on request).